Well, we didnt have to see Jonathan Papelbon's ugly face again. 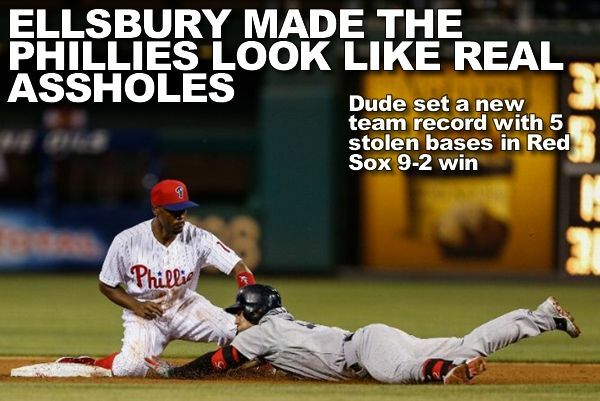 The Red Sox gave the Phillies a nice swift kick in the balls last night, winning 9-2. Jacoby Ellsbury was the story. The dude got on base five times and stole five bases. He made the Phillies look like real assholes. Ellsbury is now leading the majors in stolen bases and has reached base in 10 consecutive games. He is hitting .400 in that span. Somewhere, his agent Scott Boras has a pants tent. If you've been living under a rock and didnt know, Ellsbury is a free agent at the end of the season and most likely wont re-sign with the Red Sox. His agent is a real dickhead. So, lets just enjoy the ride until Jackie Bradley Jr takes over in center next year. Anyway, the Red Sox are now in sole possession of first place in the AL East, with a two game lead over the Yankees. That's pissa. 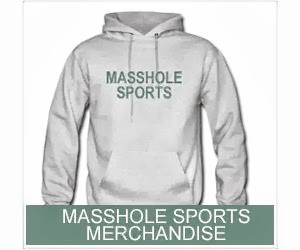 The Sox now head to New York this weekend and have a chance to really bury those overachieving pricks. Jon Lester will be pitching against CC Sabathia tonight. It should be a good one.